"We confide in our strength without boasting of it; we respect that of others, without fearing it." Tyronelea is located on 3.9 acres in the undulating hills south west of the town of Nowra. Here the dogs can enjoy the fresh country air, spending their free time running in our 2 paddocks. Tyronelea was the name of my mother's grandparents farm in Victoria. 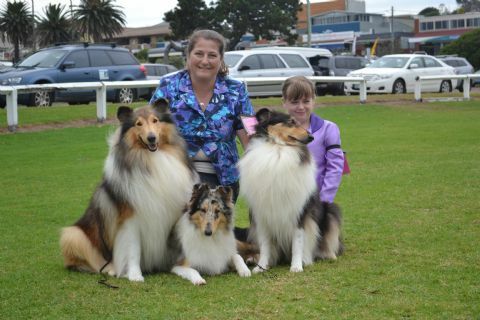 We have bred 7 litters & 10 Aust Champions including a Grand Champion, retaining a pup from each litter and I have also shown 14 Roughs ( 3 to their Grand Championships), a Collie Smooth, a English Setter and a Siberian Husky to their Aust Championships. Our aim is to breed Collies of breed type, sound health, movement and temperament. As such we DNA test all our adults & puppies, for parentage guarantee & all current genetic health tests available. All adults are Hip & Elbow scored for hip & elbow dysplasia prior to entering into our breeding program. We have been fortunate enough to have had access to some beautiful dogs possessing the qualities that we seek. A THANK YOU to those breeders who have been able to help fulfill my dreams. Belinda is an ANKC Group 5 (Working Dog) & Junior Handler Judge.